If how ever the forecast proves to be wrong as has been the case over the last few days we may have to extend the schedule to accommodate the games. All remaining games after this schedule for CPL, SPL and Division 1 will be completed in Bitburg. We will constantly post any changes on our web and in the reception of Beatrice Palace hotel at the location. We want to thank the teams and all effected by these collection of extreme circumstances for there patience and understanding. Games for Saturday have been cancelled because of lightning. Information for Sunday games will be published Sunday, 18th of April, 07:00 AM. Weather conditions allow the nettings to be set up again. We'll continue with games scheduled Saturday 8:00 and handed out Friday afternoon, right now. Due to adverse weather conditions, Saturday games have been postponed so far. Right now the netting of CPL field is raised again to see if playing is possible without safety hazards. After 11:30 there will be more information. 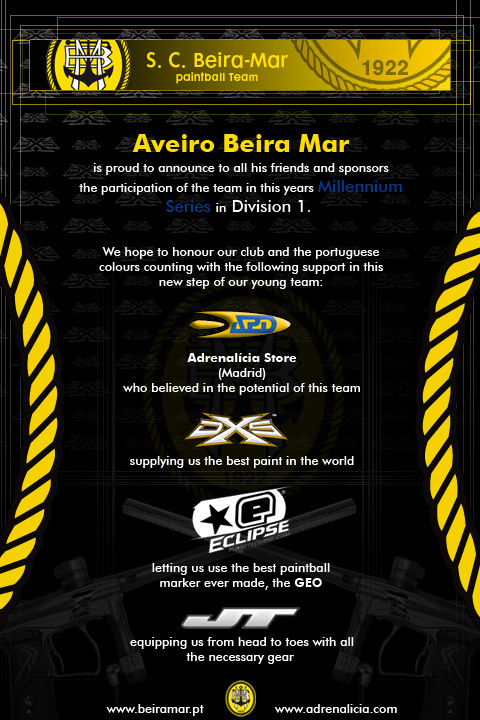 Regency Paintball continues to support the Millennium Series by signing a Gun Sponsor deal for 2010. To perfect your game we have designed a marker that shoots the most brittle paint with perhaps the lowest sound profile, giving players stealth and communicative advantages. We also take pride in our easily maintained internals, giving you extra pep talk moments between games. Come feel, look and purchase the Crome2 at the Millennium venues, we will be in the MAXS area to help you out.